The students arrived ready to listen and learn, and their first task was to put on a nametag and wash their hands. Phyllis had beautified the tables with red runners, and put out bowls of carrot and celery sticks for snacking, while I readied some hot chocolate on the stove (with rice milk as backup should there turn out to be a dairy allergy). 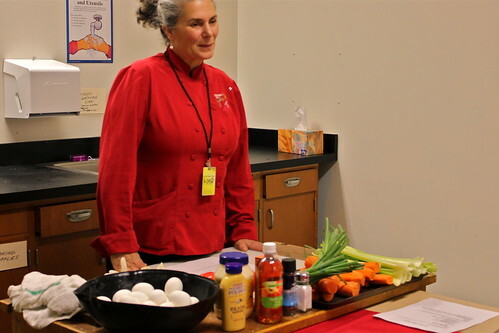 As parents of tweens, we knew an afterschool snack is vital, and rather than settling for the Capri Suns and Cheez-Its that are standard-issue with an afterschool program, we opted for our own healthier versions, in line with the philosophy of the class. I am really looking forward to exploring these ideas. 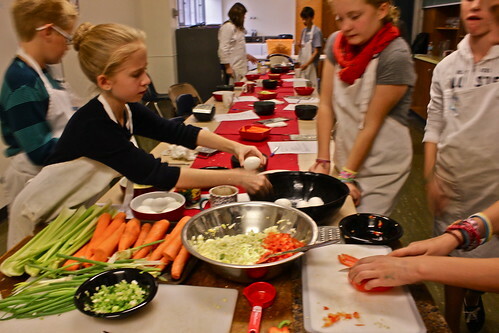 The kids then took a brief self-assessment of their skills, signed an agreement to kitchen safety and good hygiene, and then, after donning aprons and reviewing the recipe, they had a mini-lesson on eggs, “mise en place” (the French phrase for “putting in place” the ingredients for a recipe) and chopping, from our visiting subject-matter expert Phyllis (we are so lucky to have her as a volunteer!). The kids decided we needed just a bit more salt and pepper, then set out the shakers and Tabasco and sat down to enjoy Deviled Egg Salad. It was delicious on Wasa crisps and crudité (the celery and carrots left from snack). There wasn’t a drop left! We chatted about different things to do with egg salad, and I shared my “busy morning” technique: scramble a few eggs, let cool, add mayo, mustard, capers (or pickles), then serve on toast or put in sandwiches for lunch. It’s fast, easy . . . and no waiting for boiled eggs. 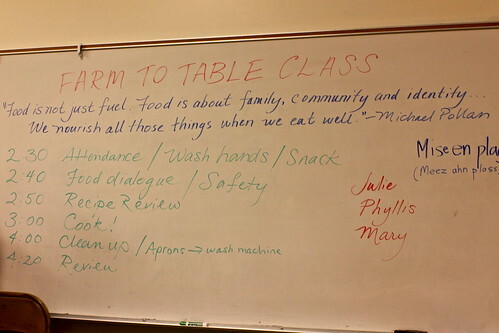 After two brief videos (Jamie Oliver on food as music and Bryant Terry on growing your own food), we all pitched in to wash dishes and disinfect the kitchen. Before we could finish, it was 4:30 pm. Class dismissed! Mary and I completed the clean up and agreed the class went wonderfully well, and the kids—so engaged, respectful, curious—give us hope for the next generation. Adapted from www.simplyrecipes.com, this recipe is great for learning chopping skills, comparing organic to non-organic eggs, and experimenting with spiciness. Leftover scrambled eggs can be substituted for grated hard-boiled eggs. Serves 8. To hard boil eggs, place them in saucepan and cover them with at least an inch of water. Bring to a boil, then remove from heat, cover, and let sit for 10 to 12 minutes. Into a large bowl, grate the eggs on the largest holes of a cheese grater (or chop finely). Add green onion, celery, red bell pepper. In small bowl, mix together the mayo, mustard, vinegar and Tabasco. 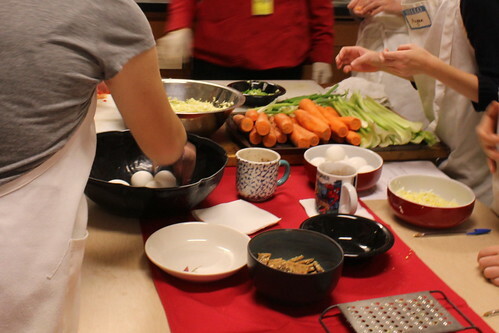 Gently stir the mayo dressing into the bowl with the eggs and vegetables. Add paprika, then Tabasco, salt and black pepper to taste. Use as a dip, spread, or filling for sandwiches or tortillas. YES! What fun you guys must have had. I'm really impressed. Can't wait to hear more… Rock on, ladies!